Purchase this item: Lighthouse 400 Lantern & USB Power Hub and Nomad 7 Plus Solar Panel ON SALE together and save! • Bright Light Anytime, Anywhere: Dimmable and turbo settings for adjustable light, up to 400 lumens. Recharge the internal battery from any USB port or from a Goal Zero Nomad Solar Panel. Use the built-in hand crank to charge up instantly and never be left in the dark. • Recharge Phones, Boost Tablets: Internal lithium battery boasts 4,400mAh with a 1.5A USB output, enough power to recharge phones and tablets even off grid. • Hang It, Stand It, Store It: Collapsible legs provide a stand for taller light and fold in for convenient storage. Built-in handle for easy carrying and hanging. • Dual Directional Lighting: Utilize 360 degree of bright LED light, or save on power and extend run times by illuminating half the lantern. • Charge Capabilities: The Lighthouse 400 can be charged by connecting a compatible solar panel. 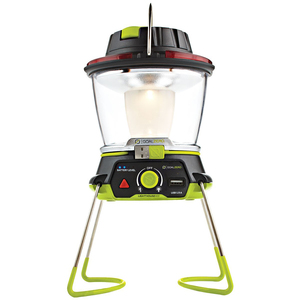 The Lighthouse 400 Lantern can also be charged by being plugged into a USB power source or use the hand crank to get 10 minutes of light for every 1 minute of cranking. Dimensions: 4.5" x 5" x 6.5"
I have purchased two of these lights. They recharge off my Yeti 1400 and there is enough light for my entire kitchen, and dinning room. Outside it will light a large area. Excellent light for those times when the lights go off or for camping. ProsProvides a high and a low feature. Small and easy to store. Should be called "Mighty Mite." ConsIt could have a longer "plug in" cord. Best UsesUse anywhere you need a light. how long does the light work on high setting ? The Lighthouse 400 Lantern & USB Power Hub features an average run time of 2.5 hours on the high setting with both sides lit. The entirety of the run time information can be found in the specifications tab on the product page. Thank you for your inquiry! What kind of battery does it utilize? Lithium? NiMH? NiCad? The Lighthouse 400 Lantern and Power Hub features a 16.3 Wh (3.7V, 4400mAh) Li-ion NMC battery. Thank you for your inquiry!